I made a couple of little tees for Lu! I had intended to make Lu some birthday shirts when he turned 4 but things don't always turn out as planned over here. I sewed up the Monster 4 shirt a couple of weeks ago. Inspired by these on Etsy. I made a monster 3 last year and he requested a 4 now cause he's 4. Have you been sewing along with Elsie Marley's Kid's Clothes Week Challenge? I jumped in and so far have sewn for an hour on kids clothes the last two days. The Lego man is one thing I finished so far this week. If you want to make one you can find the template over at MOM. I used polar fleece instead felt for the appliques on both of these shirts (except for the eyes/mouth on the Lego man) in hopes that it will hold up a little better than felt with frequent washing. Luke wanted an "L" on his Lego man as well. I have a pair of pants that I've been working on for Luke. They are almost done, but I'm thinking they will turn into shorts for Jack. We'll see.. stay tuned! These are so cool! I bet he's never dressed the same as the other kids! I love that Legoman! 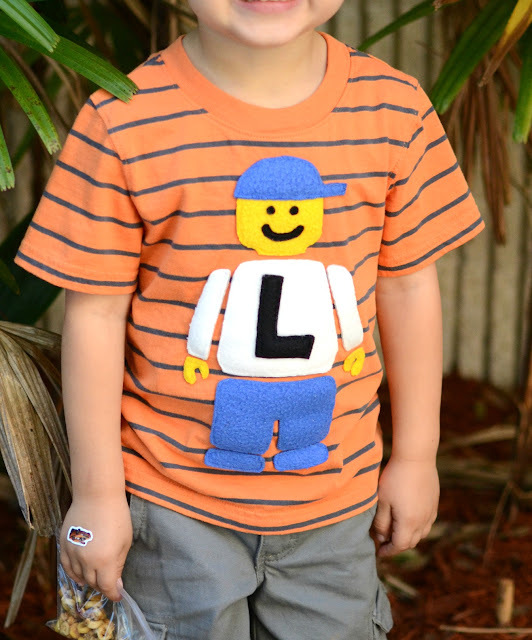 Is he going to wear it when we go to Legoland??? So cute.